This classic book is a encylopaedic and comprehensive account of the classical theory of analytical dynamics. 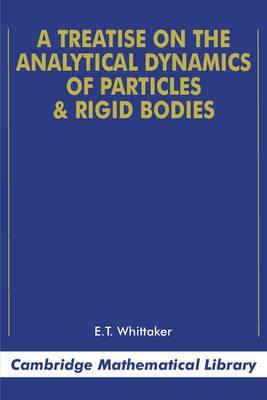 The treatment is rigorous yet readable, starting from first principles with kinematics before moving to equations of motion and specific and explicit methods for solving them, with chapters devoted to particle dyanmics, rigid bodies, vibration, and dissipative systems. Hamilton's principle is introduced and then applied to dynamical systems, including three-body systems and celestial mechanics. Very many examples and exercisies are supplied throughout. Part I. Kinematical Preliminaries; Part II. The Equations of Motion; Part III. Principles Available for the Integration; Part IV. The Soluble Problems of Particle Dynamics; Part V. The Dynamical Specification of Bodies; Part VI. The Soluble Problems of Rigid Dynamics; Part VII. Theory of Vibrations; Part VIII. Non-Holonomic Systems, Dissipative Systems; Part IX. The Principles of Least Action and Least Curvature; Part X. Hamiltonian Systems and their Integral-Invariants; Part XI. The Transformation-Theory of Dynamics; Part XII. Properties of the Integrals of Dynamical Systems; Part XIII. The Reduction of the Problem of Three Bodies; Part XIV. The Theorems of Bruns and Poincare; Part XV. The General Theory of Orbits; Part XVI. Integration by Series; Index of authors quoted; Index of terms employed.